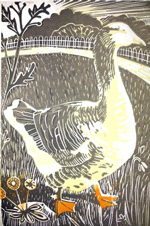 Printmaking artwork on display in the gallery throughout the year. Once again we open for the wonderful annual Open Studios. There's always a great atmosphere and there are loads of unique things to buy for Christmas gifts. Once again Ralph Levy will be opening his gorgeous barn to create a magical Christmas show. A fantastic opportunity to buy unique gifts directly from the artists. Hot on the heals of the Trinity Arts Centre solo show in Tunbridge Wells, I exhibited at this year's Brighton Art Fair at the Corn Exchange, on stand 31, which was just as you entered the exhibition at the bottom of the stairs, a great location! The exhibition featured artists from all over the country and offered a huge variety of artwork to enjoy. First major solo exhibition showing a wide range of paintings and prints at the Trinitiy Arts Centre in Tunbridge Wells. The Trinity Centre gallery is a beautiful large and light space that sits alongside the theatre and bar. Paintings and prints in the large bedroom at The Handmade House, Beards Place Farm, 98, Lewes Road, Ditchling. Beards Place Farm, 98 Lewes Road, Ditchling, East Sussex, BN6 8TZ. This year Ralph Levy has opened his barn for the show. He has created a beautiful space containing lots of gorgeous things at affordable prices. I'm showing some new winter paintings and landscape images as well as cards and a new calendar for this year. Please note the only access to the show is up a steep flight of stairs and the ground around the barn is uneven and muddy at times. Once again we open for the fun and bargain packed Open Studios. There's always a great atmosphere and there are loads of unique things to buy for Christmas gifts. The Handmade House, Ditchling - (No 16 Ditchling Arts Trail) - Beards Place Farm, 98 Lewes Road, Ditchling, East Sussex, BN6 8TZ Exhibiting a selection of lino cuts and screenprints in the magical hut in the beautiful woods. Eva Wibberley and Friends - 24, Harrington Villas, Brighton (No 4 Five Ways Group)- Lino cuts, paintings and screenprints. An exhibition of a wide selection of recent prints. The White Horse - Steyning - A small selection of lino prints on display as part of a show organised by Steyning Arts, in the newly refurbished and relaunched pub on Steyning High Street. The Handmade House, Ditchling - Brighton Festival May 2013 - Exhibiting lino cuts and screenprints in the Hut in the beautiful woods. A retrospective of her work inspired by nature together with new images. Sue Haseltine, Sharifa Brooks Read, Karen Risby, Polly's Textiles and Rachel Clark exhibited together this year in Sue Haseltine's studio. Another 8 units were open at the same time for this year's Brighton Festival. It was a great opportunity to see a wide variety of art work and crafts. Sue exhibited in two venues during the Brighton Festival in May 2009. You can download the newsletter for further details about these shows or read on here. Sue Haseltine’s new paintings and drawings were shown at the Handmade House in Ditchling. This magical house is nestled in an idyllic setting under Ditchling Beacon. Sue delivered Monoprinting and drawing demonstrations at the Barn. Sue showed a collection of recent work including prints, paintings, drawings and cards at the Edward Johnston Foundation, at The Barn. This venue was set in the heart of the Sussex Weald near Wivelsfield Green, only a few miles from the Handmade House. The Foundation showed a collection of calligraphic artwork from their collection and the work of a number of the accomplished members of the Foundation. Sue opened her house for one weekend in November showing new paintings and prints, and selling a selection of Christmas cards and greetings cards. It was a great success, with lots of visitors and lots of cake, mulled wine and tea consumed! She exhibited with Kary Fisher and Jenni Cresswell. Sue opened her studio in New England House for the annual Open Studios. She exhibited a selection of screenprints, etchings and hand-made Christmas gifts with Kary Fisher and Jenni Cresswell. May 2004 Open House with four artists showing on Tongdean Lane. Sue Haseltine, Linda Frances Trott, Marilyn Panto and Moira Wills.